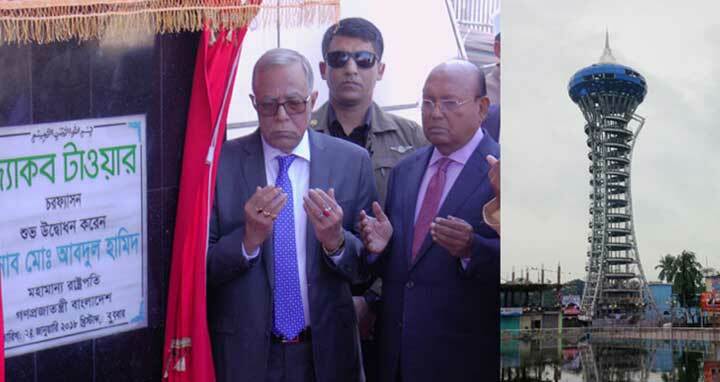 Dhaka, 24 Jan, Abnews: President Abdul Hamid on Wednesday inaugurated Asia’s tallest watch tower at Charfession in Bhola district. The 19-storey Jakob Tower standing at 225-feet high, is the tallest in Asia. Commerce Minister Tofail Ahmed and Deputy Minister for Forest and Environment Abdullah-Al-Islam Jakob were also present. The President is now in Bhola on a two-day visit to inaugurate some development projects at Bhola Sadar and Charfession upazilas. The government sanctioned about Tk 10 crore for construction of the 225 feet high tower for attracting both local and foreign tourists. Tourists will now be able to see and enjoy the natural beauty of 20 kilometres of surrounding area, including the scenic coastal areas of the Bay of Bengla. According to sources, there is a long beach in Char Kukrimukri and Dhal Char and a forest where different animal spices like deer, snakes and monkeys were released a decade ago.